Plumbers Local Union 68 needed a total overhaul on their old site, which was outdated and lacked some of the functions that current websites have. They wanted a look that echoed their pride of having been chartered since 1892, as well as the ability to have union members login from the site to easily view their dues, past tax history, and union members in memoriam. In order to make it easier for people to join the union, the officers needed to be easily accessible on the site. Many union websites are old, cluttered, confusing to navigate, and stuffed with too much information. But for Plumbers Local Union 68, we were able to consolidate their information and make it available to its members, as well as make it easy for non-members to join by contacting an officer. 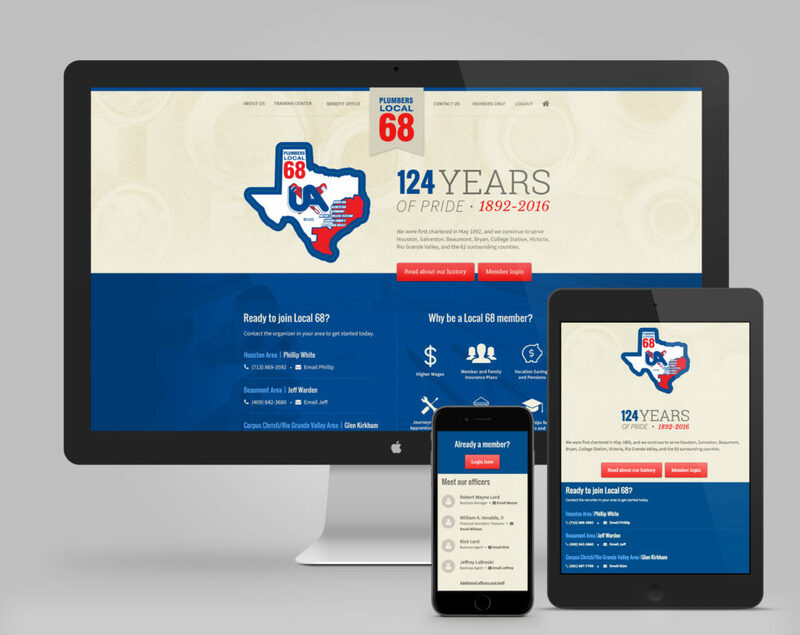 Using the company’s signature red and blue colors found in their unique logo, we created a design that celebrated the long-running history of the union and satisfied the need to have a members-only section accessible only with a login. Members are also able to view former union members who have recently passed and to commemorate their long-standing membership.